Junior Stage! is a 90 minute fun lesson for 4 to 6 years. Your child will explore theatre through drama, singing and dance. Our friendly and helpful garda vetted teachers develop the fundamentals of acting, singing, dance and imaginative play. Students are engaged in a variety of fun activities so each child is comfortable exploring their natural ability. At end of term, Junior Stage perform a showcase highlighting skills they have developed over entire course. This is also an excellent pre-school tool to help get 4 and 5 year old’s ready for primary school transition at weekends and classes are very popular. Early booking is advised as we guarantee small class sizes and they are popular! Singing teaches children the fundamentals of using their voice properly, eg, rhythm, timing, and singing with a group. We believe if you crack rhythm early, you crack singing! Dance Lessons improve balance and coordination, fine tune gross motor skills, keep fit, build muscle tone and improve spacial awareness. Drama teaches children to learn about exploration through fun activities, storytelling, improvisation, and character development. Acting class also helps concentration, build language and communication skills, enhance emotional intelligence, and build lasting friendships and teamwork. Think they’re interested, but unsure if they’ll go for it? No problem. New students can always come in on a trial. You pay only a deposit to secure your place and cover the cost of the first two weeks of the term. This way both you and your child get to test us out before committing to a full term. Although – and we are proud of this – we have a 90% success rate with trial students. Acting, Dancing and Singing classes, maximum class size is 17 students, early booking advised. We are now enrolling on a 35 euro deposit for the SUMMER TERM 2019 in Dublin, Galway, Clare and Mayo Centres. If you leave after two weeks deposit, pay no fees. If you continue, the balance is 160 per term with payment options available to ease any impact on family budgets. My child is six, should they be in Junior Stage or Senior Stage? Once your child is six, they are eligible to be in the Senior class, however many six year-olds thrive in the younger class. The goal is to find the class that is the best fit for your child and allow them to grow and develop where they are most comfortable. You may consider whether your child is better around older children or younger children, or which class is the best fit for your schedule. Our quality team of teachers evaluate children in a short amount of time and help you with the decision. The programme in which your child will have the most fun will be the right one! The two week trial period on deposit of 35 or 70 euro is a super method of testing. If you enrol in the younger class and after two weeks, we think they are ready for Senior Stage, you may switch on the third week of the term as long as a space is still available. My child is very shy, will StageSchool be a good fit for them? Absolutely! Our mission is to develop each child’s natural ability through acting, singing, and dance. Our goal is to increase each child’s confidence and allow them to feel comfortable expressing themselves creatively. If your child is shy, or has never taken an acting, singing or dance class, we will work with them to make sure they are comfortable. We will continually offer them opportunities to come out of their shell, such as offering them a solo in singing class, or asking if they would like to lead an exercise in dance or drama. But our teachers respect the “no” of every child, and students are never coerced into the spotlight if they are not ready. We believe this can be counter productive to self-confidence, and it goes against everything we stand for. 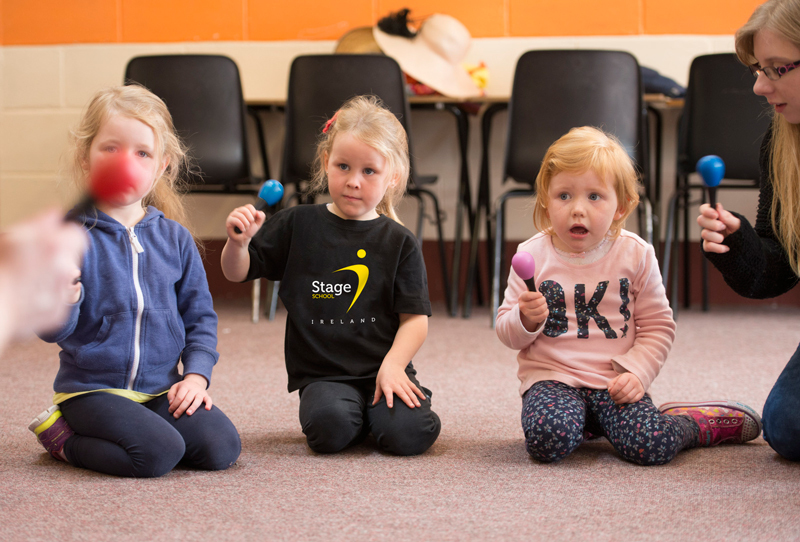 Children should wear comfortable clothes they can easily move in, such a leggings or tracksuit bottoms, with a StageSchool Ireland T shirt and jazz shoes or trainers they can move around in. Boots, Crocs, and open toed sandals are not allowed. They should also bring a small snack and a water bottle. We provide all other materials needed for the class and the end of term performance. Your child’s teacher is always happy to speak with you before or after class regarding your child’s progress. In addition, at the end of each summer term you will receive a student report that the teachers and principal has filled out for your child. The student report will summarize the material covered in singing class, acting class, and dance class. It will also highlight specific successes your child had, as well as what they would like to work with your child on in the following term. Can my child try the class before committing to the full term? Yes! The deposit you place allows you to try the class for the first two weeks of the term. It also guarantees your place if you choose to continue. If your child loves the class (and we hope they will! ), you arrange payment of the remaining balance on the third week. If you choose not to continue after the second week, you are under no obligation to pay anything further. At that point the deposit is not refunded. Not at all! We welcome children of all different levels but the one thing a child or teenager must have is enthusiasm.